One of the most frustrating things of brewing is not being able to measure volumes in your kettle at various stages of your brew day. 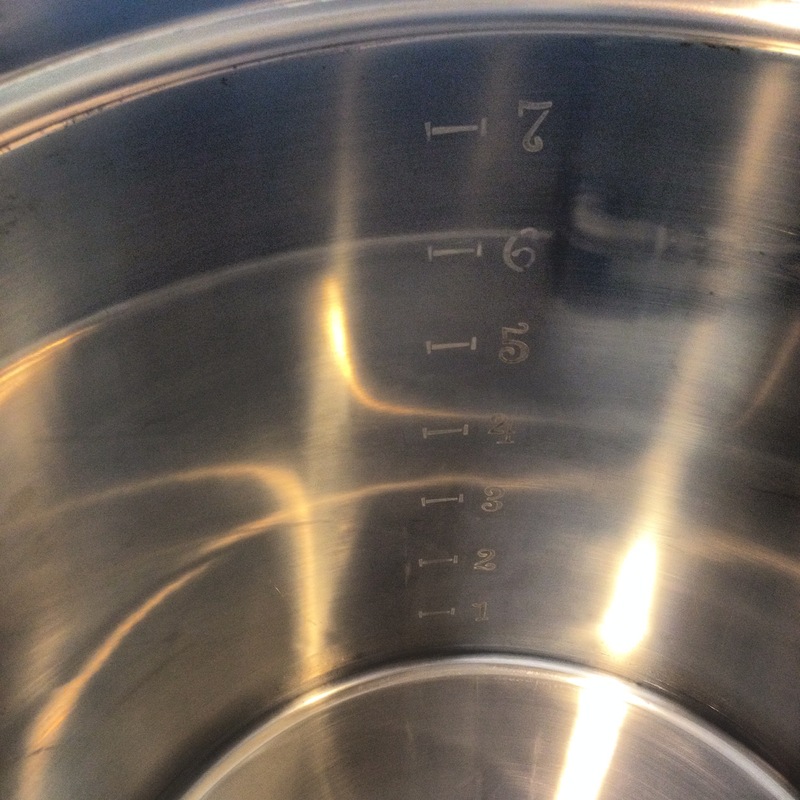 Things like mash efficiency, evaporation rate and even the basic “am I boiling the volume my recipe calls for?” are pretty hard to figure out without some type of measurement markers on your kettle. Most kettle manufacturers do not include volume markers on their products. So what is a home brewers options? 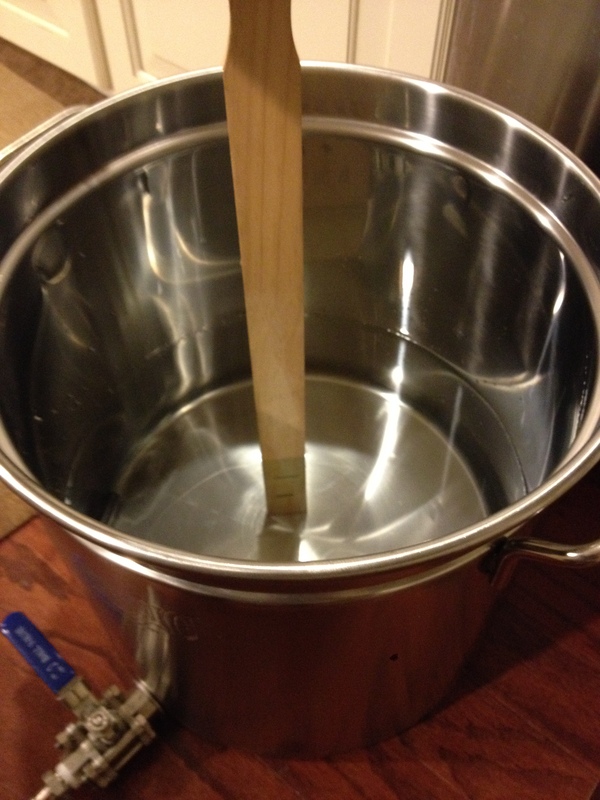 Many home brewers use a sight glass which involves drilling your kettle and extra cleaning. There is also the option of using a measuring stick with marked out volumes on it but that’s another tool you can misplace and an opportunity to introduce contaminants. The option that we will go through today is etching your kettle. It sounds expensive and complicated but its not. All it takes is a couple cheap ingredients. 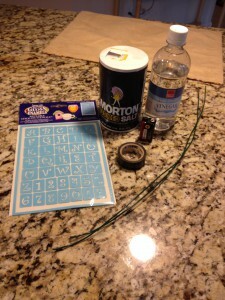 You want to fill the kettle in increments and mark off where the water is. Its important to use a container that you trust as your measurement guide. I used my Mash Tun coolers volume lines and filled my kettle up 1 gallon at a time. I then marked the lines on a paint stick with a marker. You can then measure the gap between the lines and repeat it up the paint sick. Dry off the kettle and lay your paint marker against the wall of the kettle. Then at each line place your numbers. Make sure they are on firmly and how you want them before you begin etching. Its a lot easier to adjust them now then after you have started etching. You don’t have to be a chemist here and exact measurements are not important. Fill up a small bowl or cup with about 1/4 cup of vinegar and 1/4 to 1/2 teaspoon of salt. Stir up the solution so the salt dissolves. This is the most important part! Connect a wire to the negative pole and positive pole of the 9v battery. Tape each individually on so that they do not pull off. TAPE THE POSITIVE WIRE TO THE KETTLE. Let me repeat that. POSITIVE TO THE KETTLE. It is very important that you put the positive wire to the kettle. Wrap the negative wire around the q-tip so that it is touching the soft cotton head. The wire needs to be in direct contact with the acid solution. Before you start I would suggest testing an area of the kettle first to make sure it works. You dont want to ruin your kettle. The lid is a great example of a place to test (make sure you have the lead connected to the lid though). Dip the q-tip into the acid solution and touch it to the kettle. You should hear some fizzing and bubbling around the q-tip head. KEEP MOVING THE QTIP. You want to keep moving over the area that you are etching to give it a nice even look. If you let it sit in an area for to long you will get uneven marks. After a little while the q-tip will start to turn brown or black from the reaction. You can ignore it and keep going but if you feel like the etching is taking longer you can change it out to a new q-tip. I used probably 2 or 3 q-tips. 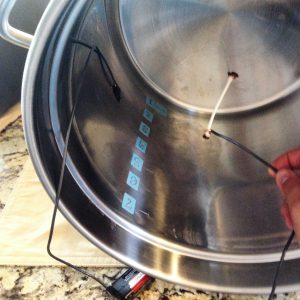 Remember anywhere the q-tip touches on your kettle will be permanently etched so take your time and watch where you put the q-tip. I know what you are thinking. Wont this add corrosion risk. No it wont. Stainless steel naturally forms an oxidized coating on their surface when exposed to oxygen. That oxidized coating is what prevents corrosion, so after you are done etching the stainless steel will naturally oxidize again and protect itself from corrosion.